49th Annual ACM Awards co-hosts Luke Bryan (L) and Blake Shelton. Country artists will be all over the small screen next week, ahead of the 49th Annual Academy of Country Music Awards, which will be broadcast April 6 on CBS. 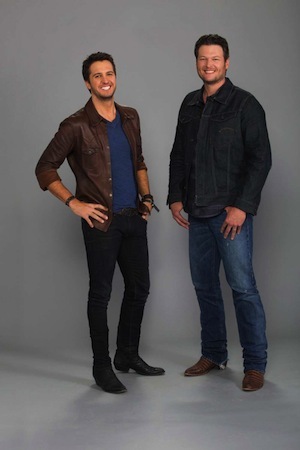 • Luke Bryan and Blake Shelton will make appearances on The Talk, on April 3 and 4, respectively. • Florida Georgia Line will visit CBS This Morning on April 4. • Justin Moore will appear on Queen Latifah on April 4. • Brett Eldredge will visit Late Night With Seth Meyers on April 1. • Brad Paisley will appear on CBS’ Crazy Ones on April 3. • Dan+Shay will guest on ABC’s Good Morning America on April 1, followed by a visit to Ellen on April 4.